Rich Kingsley visited several schools to deliver grants from The Meemic Foundation. 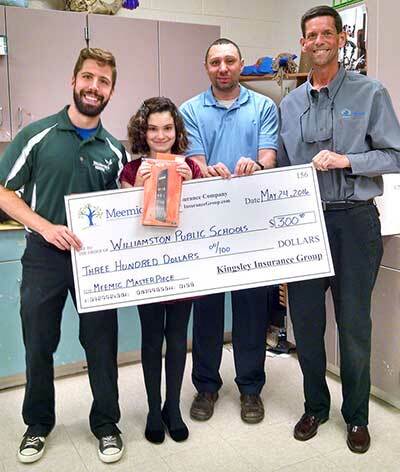 Jonathan Gere of Williamston Middle School and his student Aliana Hermann-Campana were Meemic Masterpieces winners, with the school receiving $300 and Aliana getting a Kindle Fire. Also, Jennifer Foglesong of Ithaca North Elementary received a traditional grant to expand the classroom library, and Angel Christopher of Maplewood School in Vermontville received a grant for desktop globes to help in geography lessons. Congratulations! 2019 © Kingsley Insurance Group, All Rights Reserved.